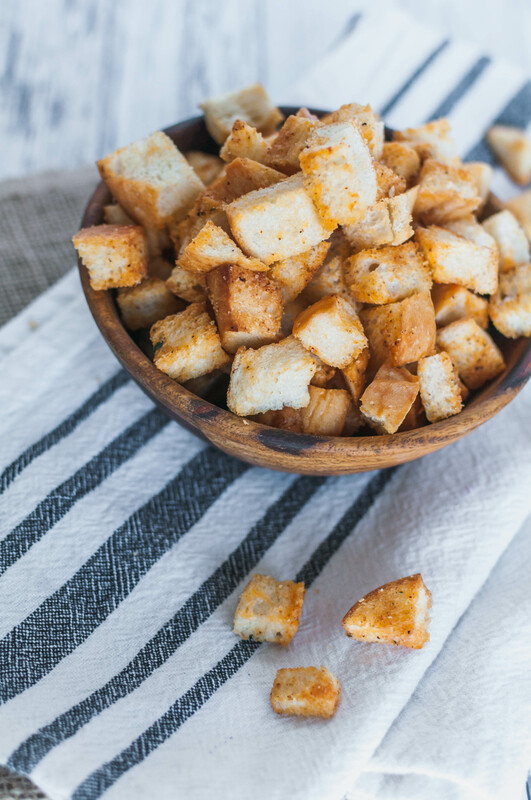 If you are a salad lover and need that carby crunch, Homemade Croutons are a must. Ridiculously easy and cheap to make with results far and above the store-bought version. **Update: This post, recipe and the photos within have been updated from its original posting in 2012. There were literally 90 words in the original post which was lame and did not do it justice. When I was a kid, I refused to eat lettuce. Not a salad, not in a taco, not on a burger. I was having none of it. And this is embarrassing to admit but this went on into adulthood as well. Yep, I was that grown up. It wasn’t until I was pregnant with Noah and decided I need to make some healthier food choices that I decided I was going to become a salad person. I forced myself to eat a salad for lunch at least 4 times a week and within a few months, I actually enjoyed them and started to look forward to lunch. I never in my life thought I would say the words “you know what, a salad sounds really good right now.” But there I was (and still am) craving salad. I may have received some dagger eyes from my mom who I tortured with my picky eating habits throughout childhood. But karma is real and that kid I forced myself to eat salad for is pickier than I ever was. While I enjoy salad, I have to have lots of stuff on it. Lots of veggies and protein but most importantly, something crispy, crunchy that isn’t a vegetable. Yes, croutons are my salad life line and I’m not ashamed to admit it. It’s the texture guys, or a carb addiction, whatever. I promise you, homemade croutons are so easy to make and so much cheaper and tastier than anything you’ll buy at the store. And this recipe uses half a loaf of French bread (preferably a day old too) which is perfect for using leftover bread from dinner the night before. That practically makes them free. If you like a crouton that is crispy all the way through, cut your bread cubes on the smaller size. If you dig a little chewiness in the center go for more of an inch size cube. Either way, the baking time will be the same. These are the perfect way to bring any salad up a notch and add that desirable crunch. Pizza salad and cobb salad are just begging for these homemade croutons. Not that I would know from experience but these are pretty tasty to snack on too. If you’re into that kind of crispy, carby, snacky situation. Preheat oven to 375 degrees F. Place cubed bread in a large bowl. Toss with melted butter and olive oil until thoroughly coated. Sprinkle with spices and toss again. Dump onto a baking sheet and spread out into a single layer. Bake for 10 to 12 minutes, until golden brown and crispy. Allow to cool on baking sheet and enjoy.